The restaurants in Paris are endless and choosing a good one might prove to be a bit of a challenge, especially for those who have never been. The service is quite formal and can be a little intimidating. Case in point: the group of six waiters who were waiting for my husband and I in a U pattern as we exited the tiny elevator and entered the dining room. Oh my, hello everyone! After a glass of wine we loosened up quite quickly and had a fabulous night watching the waiters swiftly remove and replace our forks after each bite. I kid you not! The classic dining room is spectacular, with its retracting roof which stays open during those beautiful, warm summer nights. If you can afford to splurge, it's completely worth it. The best, and most expensive, Club Sandwich in the city! And, you cannot beat the ambiance. 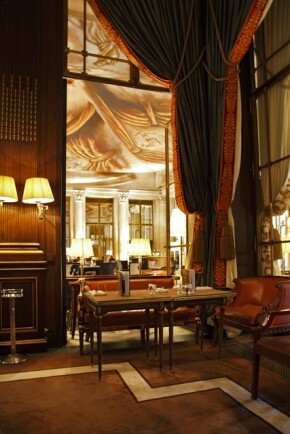 Le Bar 228, located in Hotel Le Meurice, is my absolute favourite lounge in the entire world. I LOVE this place! Oh what a night! Friends of ours recommended this fantastic, crazy place and I am so glad we went. My husband and I had so much fun banging on the tables (not kidding! ), singing along, oh, and the food, yum! I wouldn't have imagined it but the cabaret was extraordinarily good. We didn't leave until the wee hours of the night and were just a little tired the following day. But it was worth it! 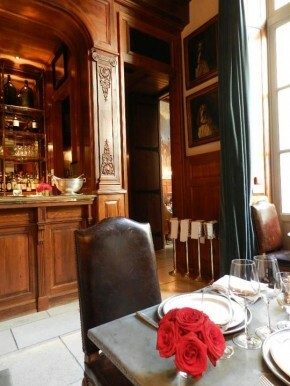 My husband and I had a great dinner at the very romantic Drouant. We shared foie gras, frites, an excellent veal scallopini and a wonderful bottle of Pinot Noir. The setting is beautiful and seating quite comfortable. 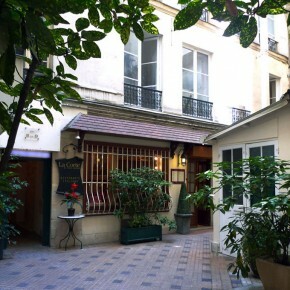 There is also a pretty terrace surrounded by lush foliage - our first choice before the rain started. 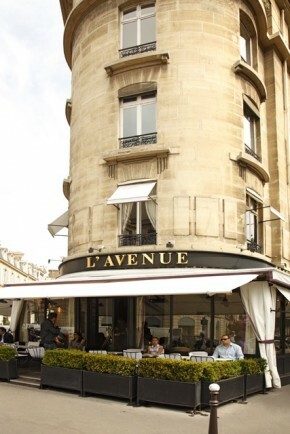 I was a little unsettled by l'Avenue at first, not quite sure why. It had come highly recommended by my sister-in-law Jacqui but also has the reputation of a place to "be seen", a lunch spot for the rich and famous. Or, perhaps it was all of the Birkin bags and oversized sunglasses glaring at me as I approached. However, when seated and looking out on to Avenue Montaigne, I had a different feeling. I loved it! I devoured a very yummy mozzarella and tomato salad, Thai spring rolls and a variety of mini macarons. I was famished and exhausted from a solid morning of touring around and in desperate need of lunch. Café de Flore had been on my must-eat list for a while. And there it was right across the street. It was a Sunday afternoon and completely packed, other than a teeny tiny corner table for one. I’ll take it! Nestled in the corner was perfect. It allowed me to sit back and take it in. I was under the impression this restaurant was a tourist spot. Well, my impression was wrong. I witnessed nothing but locals – even the little puppy sitting on the banquette beside me. After polishing off an incredibly tasty croque-monsieur, I left very satisfied. 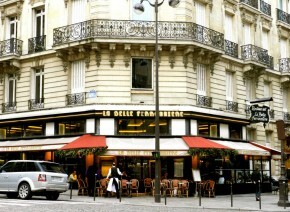 I love Café de Flore! After a full morning of shopping, my husband's plat du jour and my croque-monsieur hit the spot. 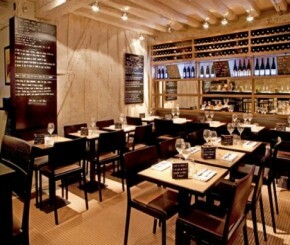 A great little restaurant with wonderful ambiance and pleasant service. Café Le Nemours is located just outside the beautiful Palais Royal, and it’s the perfect place for people watching—with a delicious menu, to boot! My husband and I spent a very cold February morning here having an excellent breakfast. The service was also exceptional, as we wanted to sit outdoors and our waiter made extra sure we were comfortable and cozy under the very effective heat lamps. 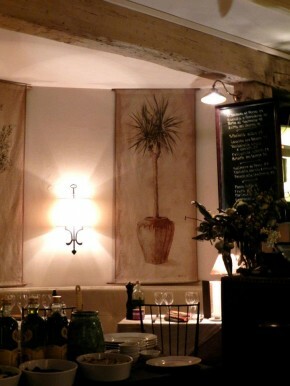 This adorable little French restaurant is so pretty, and, hands down, serves the best frites I have had in Paris. Delish! The location is superb as the terrace faces la Seine and is located at the end of a beautiful little street, Rue du Pont Louis-Philippe. 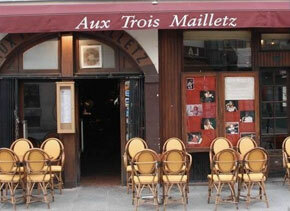 I had a terrific lunch here after a morning of some very successful shopping in Marais. My husband quickly ran in to make reservations and when he came back I could have eaten him! He smelt like an irresistible baked chicken soaked in cream sauce. They were booked, how disappointing! This is the only place on my website that I haven't experienced myself. 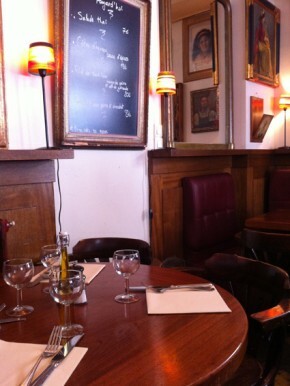 It came highly recommended by our Parisian friends and is a local favorite. Apparently the true French cuisine is to die for - at least I know the smell is! 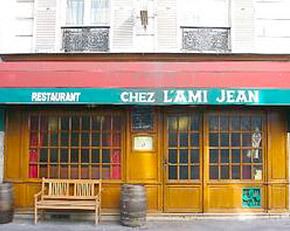 I will be trying Chez l'Ami Jean on my next trip. Update: After two years of trying I finally made it to Chez l'Ami Jean. We had a wonderful time. The food - parfait! Who would think you would find the best Chinese food while in Paris? I had an incredible dinner in this very cozy and intimate restaurant. 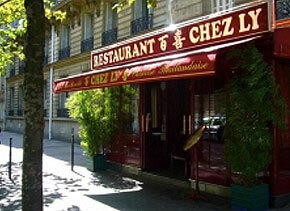 If you are looking for something other than French food, try Chez Ly. You will not be disappointed. I promise you! This tiny little organic Italian restaurant was a real find. I absolutely loved it! The ambience was warm and unique, the service friendly and the food incredibly tasty. My friend Carina and I had a fantastic evening filling up on the most delicious pasta accompanied by an amazing bottle of Umbrian wine. 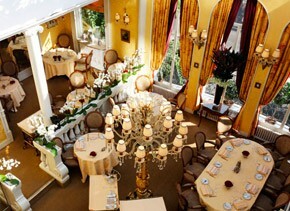 Make sure you make a reservation as it only seats a maximum of 20 very lucky guests. 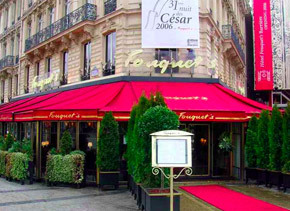 Ideally situated on the Champs Elysées, Fouquet's is the perfect place to people watch. My girlfriend Orla and I sat on the terrace for hours watching the people go by while nibbling on bread, cheese, meats, grapes and consuming lots of very nice French wine. Afterwards, a visit to Louis Vuitton was necessary, and the rest is a bit fuzzy. But I believe it took only ten minutes before we were both proud owners of brand new Louis bags! That was a very expensive bottle of wine. Ha! A different menu every day certainly keeps this restaurant interesting! The food was very French and very good. The waiter will bring over a large chalkboard, which lists the day's delicious selections. If you are a non-French speaking patron, like moi, you may need a little assistance trying to figure it all out; however, do not let that deter you. It was well worth the effort! Located at the end of an alleyway, La Corte could be easily missed if you were not sure of its exact position. And La Corte should not be missed. This incredibly tasty Italian restaurant has an authentic feel, and I do believe there is something magic in their food. My friend Joanne, who is usually quite reserved, turned into something I have never seen before. Ordering meal after meal, and diving into ours, my teeny tiny friend could simply just not get enough! It was a fun, memorable and hilarious evening! Eating at this restaurant happened quite by accident, and thank God for it. My friend Lynne had made dinner reservations there thinking it was the restaurant next door. “Uh-oh,” was her response when we arrived. Since it looked so inviting we didn’t give it another thought and walked right in. After a wonderful bottle of Italian red and plate of their mouth-watering Pasta e Olio, we were two very happy patrons. 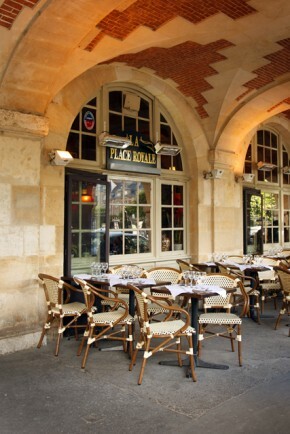 La Place Royale is located in the arcades on the southern tip of my favorite square in Paris, Place des Vosges. After consuming nothing but delicious carbs for days on end I was delighted to find such satisfying salads. It is hard to find, as Elaine puts it, a "big salad" in Paris. This restaurant is very good and I have been there many times. The vibe and authenticity of this place kept a big smile on my face from the moment I arrived to the moment I left. They put me at a snug little table—it always astonishes me how the French like to pack ‘em in; a table for two, set for five. I love it; it makes for a cozy experience. As I sat at my little table waiting for my lunch date I very much enjoyed the view: the red leather weathered banquettes, wooden French bistro chairs, old stone walls covered with antique framed portraits and prints, and everything under the perfect lights. This was French country at its best. Oh, and the food! My lunch was the plat du jour and it was the most tender bœuf with tasty, ultra-creamy mashed potatoes, and for dessert, an apple crumble pie. Très, très bon! 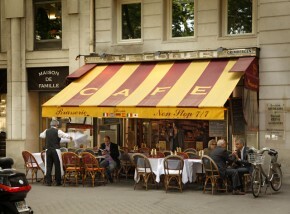 There are so many restaurants in Paris that it is difficult to find a favourite. 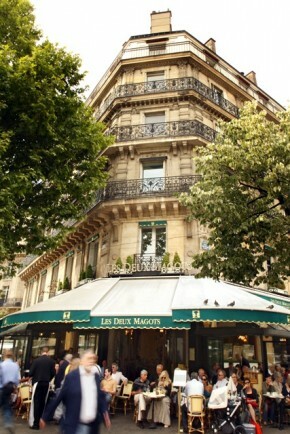 However, I do find myself always returning to Les Deux Magots. 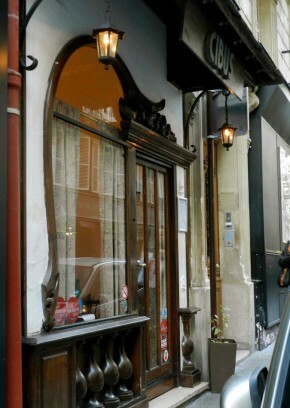 The restaurant is quite popular among locals and tourists, is always bustling and sits on an exciting corner, Saint Germain des Prés and Rue Bonaparte. The scenery is lovely as it faces the oldest church in Paris, the Abbey of Saint Germain des Prés. Be sure to peek into the church before moving on. On the south end of Place du Marché Saint-Honoré sits a unique place called Nomads. The dining room is decorated in an exotic safari theme with zebra print carpets. The food is fabulous, the servers are very friendly and the art displayed in the windows is for sale! I wanted a club sandwich sans Dijon mustard! How can you love Paris and not love Dijon mustard? I know it’s crazy. It’s also crazy that I cannot speak French - another problem I will one day conquer. 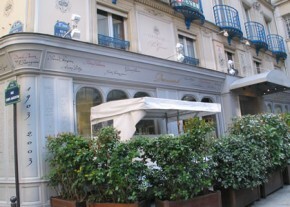 After seeing the pictures in magazines I really wanted to try Ralph’s, Ralph Lauren’s new restaurant on Saint-Germain. The pictures I had seen do not do this restaurant justice. The courtyard is packed full of beautiful trees, the bar feels cozy and clubby, and the dining room is right out of one of his gorgeous ads. The setting is quite perfect. Our lunch was exceptionally good and the service was excellent. I know it’s difficult to tear yourself away from those glorious French cafés, but Ralph’s is worth it! I always feel a little guilty eating at a non-French restaurant while in Paris; however, I definitely did not feel guilty about my dinner at Verjus. This little restaurant, run by an American couple, is hidden in a corner just north-west of Palais-Royal, which makes it even more appealing. Study a map before you head out, as I knew exactly where it was nestled and still had difficulty finding it. 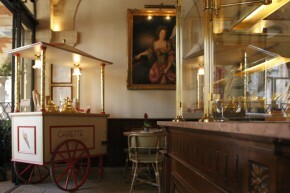 For mouth-watering crepes and a fabulous café au lait, Café Hugo is just the place! 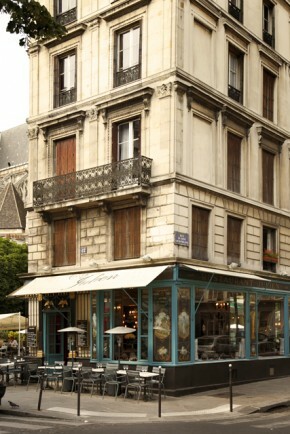 Located in Place des Vosges, Café Hugo is a great start to your day or mid afternoon indulgence. 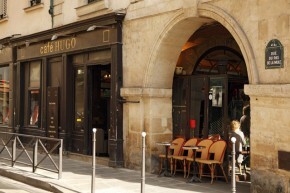 I've tried many crepes in Paris and although most places serve delicious ones, there is just something about Café Hugo. 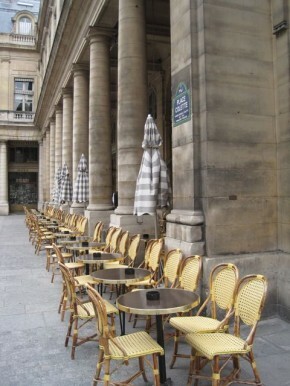 I was meeting up with my friend Lynne at this beautiful café in Place des Vosges. Though I enjoy sitting outdoors in cold weather, it was still a little too rainy that day so I decided to sit inside the doorway at a very little bistro table and await my friend. Because it was such a nippy day I ordered a steaming hot cup of lemonade. Wow! Did the trick. Very hot and very good! When Lynne arrived she took one look at my lemonade and declared: “me too!” Her cheeks caved in and her eyes popped out after the fist sip. While she was frantically waving her hand in front of her mouth, I quietly pointed to the sugar. Their assortment of beautiful little pastries was very tempting, as was their lunch menu. Next time! 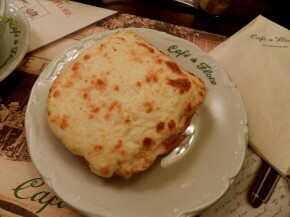 For those who know the croque-monsieur, well, I've had them all over Paris and my favorite has been from Le Colibri. I was beside myself the entire meal, oohing and aahing with each bite. 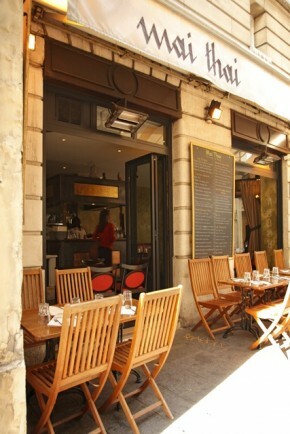 Le Colibri is located in a great area, Place de la Madeleine. A wonderful lunch spot! I had dee-licious crepes at this cute little cafe. 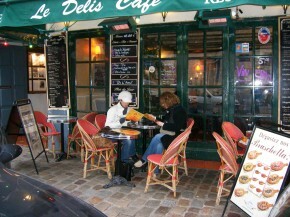 A perfect lunch spot if you're touring around Montmartre. 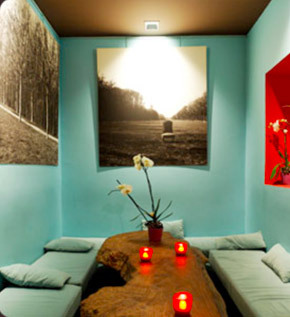 For some delicious Thai food try Mai Thai in the Marais district. Thai is one of my most favorite cuisines and I was quite impressed with this restaurant. My husband is a serious juicer. The amount of work he puts into his juice every single morning astonishes me! So, while walking along Rue des Capucines we came across Naked. I do believe his heart stopped. Without any hesitation whatsoever he went straight in to order his juice. There are other healthy choices as well, such as salads, fruits and sandwiches. Naked was packed! A popular place indeed. 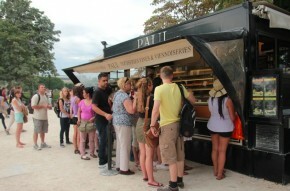 There are baguette stands everywhere in Paris serving the most delicious, fresh baguette sandwiches and croque-monsieur's you will ever taste. And you cannot beat the price. Take it to go and find a park!